You know that feeling, you can sense it right in your gut that something is right or wrong. Maybe you first experienced this feeling as a child when you were getting into something mischievous or again as an adult when you met someone at a party and just knew instantly you two were meant to be friends. This is your intuition speaking to you, helping to guide you and protect you and this intuition of yours is a very powerful sense, one that many people underestimate. The entire concept of intuition, derived from the Latin word ‘intuir’ that means the knowledge from within, means that there is a life path each of us is meant to be on. Therefore, a combination of alarms go off in our subconscious when something is meant or not meant to be. I like to think of these alarms as our own natural security guard. They are there as a form of protection to help you stay on your true course in life. The only issue with these alarms is that they are not glaringly obvious to people who are not tuned in with their subconscious. If you have a great disconnect with your subconscious, which most people nowadays do, it will be next to impossible for you to truly recognize these signs. The main difference between intuition and just thoughts is how you actually feel. If what you are thinking is driven by anxiety, fear or even joy and happiness there will be a great deal of emotion tangled within it. These thoughts are most definitely not your intuition speaking and often times listening solely to this aspect of your mind can get you off course in life. If however, what you are experiencing is truly your intuition speaking to you then chances are it won’t be energy charged at all but instead there will be a feeling of calmness. Remember, this is your destiny following its true course, this is where you are meant to be. When everything is as it should be there is nothing to be stressed about or anything to question. Intuition doesn’t always have to be rational. Trust me, I understand how difficult that is for our society today to accept. We are all raised to believe that being rational is being correct. However, 9 times out of 10 your intuition tends to not be rational. That does not mean that you should immediately dismiss it. Life has a funny way of taking us through life in ways we never expected for ourselves. Don’t fight something that feels right or comes naturally to you just because it isn’t the most rational decision. Sometimes you have to let your natural instincts or hunches take the lead (and trust me if you do, you’ll almost definitely have a good time). Also, don’t get too hung up on learning to follow your intuition. As long as you are open to the concept and take a few moments before making certain decisions you will begin to recognize it on its own. Personally, I didn’t even realize how often I was actually following my own intuitions until I was re-reading old journal entries. I quickly began to notice a pattern of different entries saying key words of intuition like “it all just felt right” or “it became clear to me I needed to learn more”. All those times I felt those moments of clarity was just me following my trustee intuition. Ghosts, Spirits and Demons, Oh My! Those of us who are highly connected to the spiritual world deal with paranormal encounters on a daily basis. In the beginning this would often wear me out because one, I didn't have a firm understanding of what was actually happening and two, I had very little control initially over when or who I would connect with. Who you are connecting with is very important because there are many different energy sources out there. This is a fact I've always found extremely interesting because many people don't realize there are different types of energies you can stumble upon in these meetings. For example, there is a difference between a ghost and a spirit. Ghosts are spirits that have not passed over to the other side. Due to their inability to pass, an encounter with a ghost usually leaves us feeling shaken or can be described as eery, unsettling or traumatic. It is definitely not necessarily a positive connection. The energy of a ghost is that of unrest, they are usually searching for answers or trying to complete any unfinished business with someone still living. What I most often connect with is spirits. Spirits are souls that were able to pass over to the other side and usually only return to bring guidance to loved ones. More often than not when I am able to connect with any spirits I feel an overwhelming sense of peace. Usually this feeling of peace, I believe, is meant to make me feel comfortable and at ease. I like to describe myself as the inbox between the spirit and their loved ones. Spirits use me as a middle man to get their messages out there and thankfully because of this they often approach me in a very gentle and calming manner. An encounter with a demonic presence is an entirely different story. Through my studies I have had the privilege to witness and participate in demon extractions and let me tell you just from their energy alone many people can find themselves getting physically ill. When a demonic spirit enters a room there is no denying their presence. While my personal experience with them has been limited I can say that they are extremely draining. The first time I witnessed a demonic extraction I left the room feeling completely depleted. So you can only imagine how much an individual can be affected by a demon if they have no idea what they are experiencing or are totally unfamiliar with the spiritual world. Don't get me wrong. I understand that to a skeptic a lot of this information can sound like a plot from a Ghostbuster film but if you find yourself constantly noticing unexplained smells or feeling as though someone is touching you when no one is around there is a good chance someone is trying to get in touch with you. I've said it before and I'm sure I'll say it again but the more information you know the better off you will be. The more you know the easier it is to notice the signs of paranormal activity around you. Circles play a very important role in the spiritual world. A circle is the shape that represents the earth, sun and moon. It is found all around us in every aspect of life and is the representation of infinite wholeness. The word mandala itself literally means circle. I often use mandala's in my healing's as a meditation tool. Often times our minds are too concerned with the difficulties that we each face day to day. Whether that is worrying about how you are going to budget your money or just the daily stressors of balancing family time with work responsibilities. While everyone's stressors vary there is one common trend among us all, we are all constantly thinking about them. Therefore, the point of meditation is to remove these stressors from our minds and allow ourselves to find our center, to become more connected with the universe around us and to take us out of our physical space, even for just a few minutes. Mandala's can be used by those at any skill level of meditation however, I introduce them immediately to beginners to help them reach that mental space of higher consciousness. True beginners of meditation often find themselves getting frustrated in the beginning. It is a skill to be able to slow down both the mind and body.. Therefore I use the mandala to help teach my client's how to tune out the world around them. Concentrating on your colors and just simply coloring may seem childish but it is actually quite relaxing and at least stops us from focusing visually on what is happening. Interested in trying out mandala meditation for yourself? I've included a blank mandala above, feel free to use that one or click on it and pick out a different mandala for yourself! As a girl constantly on the go I am always on the hunt for comfortable and stylish looks. Thankfully my never-ending obsession lead me to discovering Matter. Matter is a clothing line started by two friends Yvonne Suner and Ren Ho, who were driven by their idea of creating a better, more stylish world. Their first collection is a series of fun, functional pants using artisan printed and loomed fabric. With employee's based all around the world anywhere from Amsterdam to Singapore, this brand truly has a global reach. They've been covered in major magazine's like Vogue and Conde Nast Traveler. These designers have a passion for bringing countries together to create a global community. The site explains where each piece is made and how it is constructed. They are committed to spending a great deal of time understanding the cultural history of a region and understanding the symbolic messages that coincide with each print (and it doesn't hurt that their clothing is absurdly comfortable!) With styles for both men and women it is the perfect gift for anyone with a cultural openness looking for their next fashion statement. In a perfect world, everyone who has tapped into their psychic abilities would have respect for their craft. They would understand that these abilities are to be treated with respect. However, this is definitely not always the case and because of that I wanted to take this time to address psychic attacks and what measures you can take to recognize them and to help protect yourself. First it is important to note that while psychic attacks can be intentional and done to bring direct harm some are just simply a negative energy that others are unknowingly sending out into the universe. This is why for those of you who live in a densely populated area, such as a large city, extra precautions need to be taken to guard yourself against absorbing the negative. The concept is simple. Think about anytime you've had to help a friend through a hard time, such as a death or heartbreak. Even though you yourself were not emotionally effected by these events you might still leave your friends side feeling emotionally or physically fatigued. There is a reason this is happening. When you are around someone who is in a highly charged emotional place you are going to be able to pick up on this energy and it can affect your energy levels as well. Ringing bells is believed to help tune in frequencies and the vibrations are used to break up negative energies. Using a chant that is personalized to yourself and sets your intentions is a very simple way to keep negative energies away. This is an absolute must for me after a jam-packed week of healings. Imagine all the negativity is washing away and exiting through the steam from the warm water. You know what is an easy little trick to bring a little joy back into your life? Just add a pop of color. I know it sounds silly but color is what we associate with fun, youth, and anything whimsical. There's nothing wrong with bringing a little bit of that childhood joy back into our adult lives. So with that in mind I recommend to you my latest online find, The Prism. Located in the suburbs of Sydney, Australia this online boutique is based on the principle that color can add a little happiness back into your life. Just looking for a pop of color? 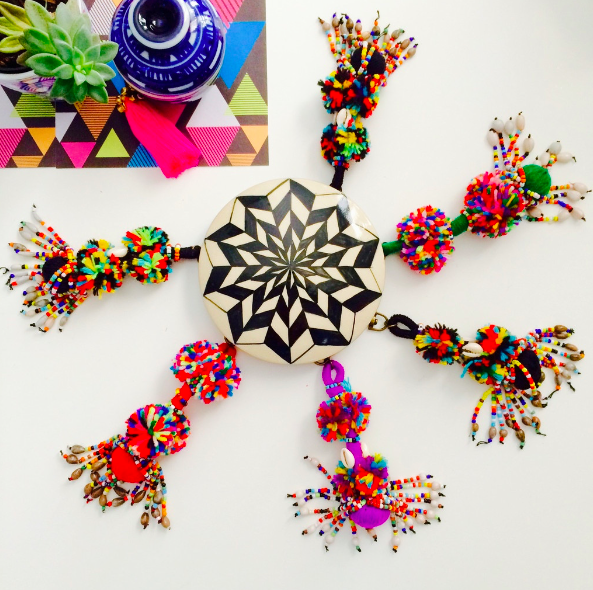 These key-chains add just a small spark of color into any monochromatic wardrobe. 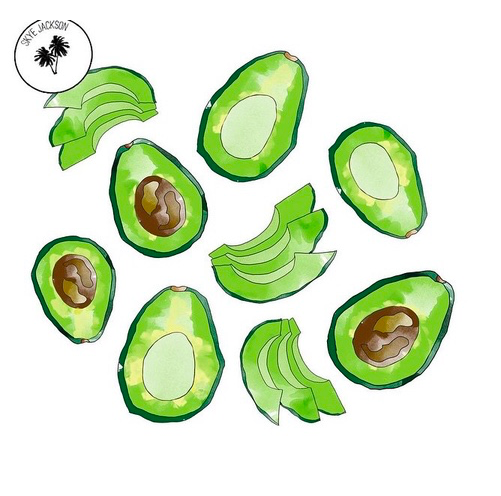 My obsession with avocados is definitely not going anywhere anytime soon and this print would find a home perfectly on my kitchen wall. Not only is avocado a superfood for the sixth sense, but the color green represents success, healing and the heart chakra. As if my obsession with hot pink wasn't big enough this fringe back has be totally swooning. I love the Native, South American & Mawri design influences. You know that feeling when you meet someone for the first time and you can't help but feel as though you've known them forever? Some people just write it off as simple deja-vu however there may be another explanation. These people, those that you just instantly click with, they are in your soul group. A soul group is a collection of souls that are reincarnated together from lifetime to lifetime, switching the role they play in your life. In one lifetime someone in your soul group can be your best friend and in the next that same soul can be your mother. No matter what their role is to you they are always somehow connected. The purpose of this group is to help you grow into the person you are meant to become and vice-versa. You are all there to support one another and for guidance when life isn't exactly going your way. Now this isn't to say that someone in your soul-group will be in your life the entire time. Occasionally someone from your soul group is only around to teach one life lesson. A member of your soul-group could, in this lifetime, pop up as a boyfriend or girlfriend. This does not mean that you two are destined to be together. All this means is that you are meant to learn something from this relationship and once that lesson is absorbed the relationship comes to an end. How can you spot someone from your soul-group? First off, don't ignore that initial feeling of immediate connection. Learn to follow your gut and trust your instincts. Your soul is aware of things that seem illogical to your brain. Members of your soul-group often have eerily similar stories as your own. This is no coincidence. Rarely in life is anything a true coincidence. This happens because you are meant to learn from one another. The best part about people from your soul-group is the effect they can have on your mood and your attitude. Often these are the people that help bring calmness and that can build you up in a way that no one else could. When you are with them you are kinder, happier, more compassionate. They make your weaknesses seem small and build upon your strengths; they truly make you a better version of yourself. My suggestion when you feel as though you've found a member of your tribe is to let this friendship just flow naturally. Don't fight it and don't push it. Destiny has a plan and you just need to be willing to go along for the ride. Often we hear people speak about bad karma. After someone has done something in bad taste or after a horrific break up, a friend might suggest to you in a time of consoling "not to worry because karma will take care of them". However, what we don't often talk about is good karma. Many people forget that if they set each day with the intention of doing good they can boomerang that goodness right back to themselves. (Quick tip: Your kindness needs to come from a place of purity for this to be true, not just because you want good things to come to you). It might seem like a simple thing just being kind to others but sadly we live in a world that is all about competition and only looking out for ourselves. So if you're having a hard time even seeing where you could be more kind I've come up with a few easy tips to get you started on your trek to decency. 1. Pay someone a compliment - Seems like a no-brainer but sometimes we forget how far a compliment can go. Making someone feel good about themselves tends to have a ripple-effect. If they feel good about themselves they will have an easier time seeing the good in others and have a desire to point it out. 2. Listen - I can almost guarantee you're not doing enough of this and truly it is harder than one might think. Instead of only listening until you get a chance speak take a minute and just truly take in what the other person is saying. Sometimes you hear but you don't truly digest the context. 3. Admit when you're wrong - Pride is the ultimate downfall of good karma. Having too much pride will never help anyone in the long run. It stops you from being able to admit that yeah you screwed up. What is important to realize is no one is perfect. Everyone makes mistakes but not everyone is able to right their wrongs. Don't just let your mistake fade into time - deal with it head on. You'll feel much better afterwards, trust me! 4. Good manners - Giving a pregnant woman your seat on the subway or opening a door for an elderly man, these are little things but when other people see someone doing what is "right" they are much more likely to follow suit. There's a reason why people suggest leading by example. Good luck and remember, be kind! Just Finished a Psychic Reading, Now What? You just walked out of your first palm reading, channeling of your spirit guides, or whatever your preferred reading might be and you're overwhelmed with information. Maybe some of what you heard was hard to swallow. It might’ve been made clear that a friendship you’ve been holding onto needs to come to an end. On the other hand, a lot of what you just heard was wonderful, maybe your spirit guides just informed you of an up and coming romantic relationship or the palm reader suggested you will have three children. Trust this information, there is a reason why those connected saw these things for you in your life. However, don't let it consume you. Life can change at any moment, nothing is set in stone and you still have free will. My best example of this is the "Choose Your Own Adventure" books that many people would read as children. The basic concept of these books is at the end of a chapter you would have to make a decision, choose where you think the characters should head to next. Whatever path you chose in these books would bring you on a different adventure. Ultimately, the lesson learned here is that every decision or non-decision we make as human-beings can take us on different journeys in life. Yes, when you had your meeting with your spirit guides you were currently on path for a new romantic relationship. However, nothing is guaranteed in life. You can easily make a decision that would take you off course from this coming true. I personally try to view my sessions with my clients more as a type of therapy than predicting the future. It is important to have these reminders in life of what could be coming your way. You need to be open to these positive things happening to you. If you are constantly negative and don't truly believe your life can follow down this sensational path then that is exactly what's going to happen, your life won't follow down that path. You need to be open to life, to love, to positivity in order to receive it. Years ago coffee was my way of life. I would request all of my loved ones to not even bother attempting a conversation with me until I had at least a few sips of coffee. However, as my journey into the spiritual world continued it became apparent to me that I could not have dependency on any substances. No matter how minor they are. Don't get me wrong, if coffee is still your thing there's no shame in that. However, if you're looking for a new way to get your day started off on the right foot I have a perfect solution. Morning mediation. 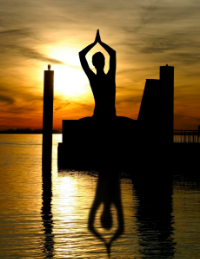 Waking up early with enough time to meditate starts your day off with a sense of calm and purpose. Giving yourself time to reflect on what you want to conquer throughout the day will set the tone for accomplishment. Also, freeing your mind up allows for you to channel and can evoke a connection with your creativity. I find that many days this is when my most successful ideas first come to me. Of course I am free throughout the day to build upon these sparks of inspiration but for some reason my morning meditation is where I always find the foundation of my next big move. For this reason I try to always keep my journal close by during my morning meditation. I try not to put any limitations on myself so if my morning meditation shifts into journaling or channeling I try to just go with the flow of the moment. It is important to keep in mind that some days it'll be hard to allow your mind to settle even if it is first thing in the morning so give yourself a break sometimes. Maybe some mornings you'll only be able to allow yourself a few minutes and others you could easily go for thirty. There is no perfected way of doing this so just try to find a rhythm that works best for you. Often I like to end my morning meditations with some type of stretch or almost mini yoga session. Nothing too strenuous just something to get my body ready and geared up for the day ahead of me. This allows your muscles to stretch and a natural flow of strong breathes. Next thing you know you'll be ready to tackle whatever the day throws at you. If you live in New York City you've almost definitely heard of Cutler Salons. Owned by Rodney Cutler with three NYC salons, each stylist chair is housed by some of New York City's most talented hair stylists. Honestly, if you're in the market for a new hair stylist don't hesitate to stop by any of his locations. All of Rodney's employees are talented and amazing (most, if not all, work Fashion Week shows, style the lady locks of some of the most well-known celebrities and bring trends to the masses through fashion magazine editorials ). I'm not sure if Rodney has a knack for hiring wonderful people or if wonderful people are just drawn to Rodney but it was while on set for a previous project that I had my first chance to meet one of his lead stylists and educators, Heather Packer. Upon meeting Heather I knew instantly that I would like her. She has a warm smile and just an all around positive attitude. Which is saying a lot considering how insanely hectic some of the projects can be that I've worked on with her. However, it wasn't until after I had a chance to get to know her more that I realized just how sincere and genuine her kindness really was. Heather is the founder of a charity organization called Fearless Beauty and she has been working hard to spread the word about her fantastic organization. Fearless Beauty started after Heather had an opportunity to visit India and saw how many people were struggling to provide for themselves and their families. Heather knew that she could not just sit back and not do anything so she began brainstorming ways that she could help in a sustainable way. Partnering with the Khushi Foundation, a charity that provides medical, educational and spiritual support to the children of Rishikesh, India. Fearless Beauty teaches participants the art and trade of hairstyling, instilling a passion for success through mentorship and giving them the tools to earn a sustainable and fulfilling livelihood. Heather is truly hands-on with her charity work and spends months visiting India and further developing her program. I have so much respect for anyone who truly gets down and dirty when it comes to their charity work. I urge you all to check out her site. The site is filled with inspirational stories and just downright kindness. Check it out, you won't regret it! Alright, we're officially in the new year and I can already tell your new year resolutions are beginning to falter. I'm sure everyones resolutions are many of the same things; lose weight, quit smoking, be more organized. We all aspire to better ourselves in many of the same ways. Well if your resolution was to be more organized let me step in and rally you to continue on this quest. Clutter is an immediate trigger for stress and stress is incredibly harmful to both your body and soul. Even if you are a neat person, clutter can still be having an impact on your stress levels. Maybe it's a "junk drawer" stashed away in your room or a hallway closet full of only God knows what. According to the practice of Feng Shui, where your clutter is in your room could represent certain issues you may be having and where you are blocked up spiritually. No matter how big or small your clutter stash may be it can still have an impact on your stress levels. So to better help cleanse you of your bad-cluttering habits lets take a few tips from the concept of Feng Shui. This part of your home holds a great deal of significance in the practice of Feng Shui. The front door is often referred to as the mouth of Chi. It is the mouth of your energy source and therefore should be kept balanced and beautiful. Don't allow mail or garbage to block this area. Instead keep only in-season items in the entry way so that you don't allow "stale" energy to flow through your home. Clutter in your kitchen is easy to collect and easy to ignore. Holding onto the unnecessary in your kitchen can have a direct impact on your health. Removing excess from this part of your life will leave your soul feeling refreshed. A major Feng Shui tip is to try removing all harsh chemicals from your kitchen and switch to natural ones. Having a cluster of harsh chemicals such as many brand name cleaning supplies is like bringing poison into your energy space. Your bedroom especially should be one of the most tranquil places in your home. This is where you rest your head at the end of the day and find a place of deep meditation. If there is a great deal of clutter in your bedroom this could be a reflection of your current state of happiness. In order to bring peace back into this room remove anything of excess such as the TV, remove clutter from under the bed and especially exercise equipment. Keep this room simple. In search of more tips are tricks? Pick up a copy of "The Life-Changing Magic of Tidying Up the Japanese art of decluttering & organizing" by Marie Kondo. She is on the New York Time Best Seller list for a reason! Mystical Gift Guide: Something for every witch in your life! Not only is this necklace a gorgeous accessory to add to any girls collection but the crystal Agate is exactly the crystal boost your girlfriend needs this time of year. Agate promotes inner stability, composure, and maturity. Its warm, protective properties encourage security and self-confidence. This is the group gift for you and some of your more adventurous friends. A 5 days/4 night camping trip filled with morning and night yoga, and eight local organic and vegan meals. This is a five-day celebration of cultures past, a remembering and practicing of basic human skills to ensure the survival of the body and the soul. If you're looking for something custom this holiday season The Numinous has one of the most unique gifts I've seen yet! For your unique birth chart shirt, simply enter your full date of birth into the YRStore consoles, and our program will create a completely custom design featuring illustrations by one of our favorite artists, Erin Petson. Looking for a gift with a bit more of a masculine feel? This mechanic soap from The Greater Goods has activated charcoal, natural essential oils and according them just a little bit of grit. Soap may not be a traditional gift for the fellas in your life but after one use I'm sure they'll be begging you to find out where they can buy more. 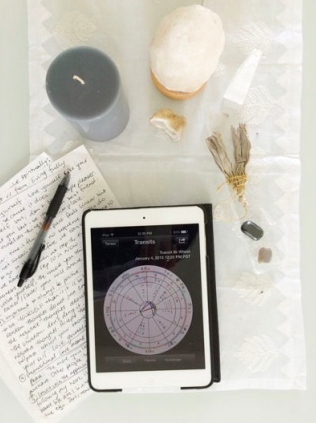 What better way to start 2016 then to have an in depth reading of your astrological chart. Tanaaz is deeply gifted and able to connect with her spirit guides in order to bring her clients unique and personalized messages. With a special gift such as this you won't have to worry about someone else buying the same thing! Spiritual Kindlings is collected by hand from fallen branches of non-endangered Pine, Oak and Eucalyptus trees on a ranch in Malibu. Each bundle is naturally unique and hand tied in artisan and fashion and has the healing and spiritual properties of California. My friends and I carry on a yearly tradition of burning our spiritual kindling's on New Years Eve and setting our intentions for the upcoming year. Written and illustrated by Kim Krans this 78 card tarot deck is an inspiring gift whether the receiver is new to tarot reading or a seasoned vet. 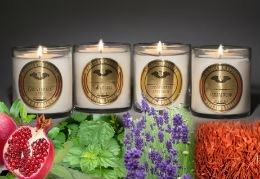 Created by celebrity psychic, Thomas John, these soy-healing candles will help cleanse the mind and spirit as well as center the soul. The best little stocking stuffer around, these beautiful necklaces and Mala's are handcrafted in India. A Mala is a treasure and a classic companion to fruitful meditation. A Mala always consists of 108 beads, because the number 108 has many important meanings. This story begins with a New York hotel room key. Actress and singer/songwriter, Caitlin Crosby, started wearing the hotel key as a necklace while on tour and had the idea to start engraving old, used keys with inspirational words. Realizing that, in a way, we are all like these keys – unique, flawed, scarred, and sometimes discarded by others – she wanted these keys to have their purpose renewed over and over again. Help send positivity by gifting this to a friend in need of a pick-me-up! Give the gift of wisdom. Wildcraft studio offers classes for anything from Frame Loom Weaving and Kalapuya Basket Weaving to The Art of Scent: Perfumery 101 and Spring Mushroom Hunting. Not sure which class your friend would enjoy most? No problem! Just purchase them a gift certificate! Thomas John unveils his first self-authored book detailing his experience as one of the world's most highly regarded psychic mediums in his new book, Never Argue with a Dead Person. In this highly anticipated book, Thomas shares insights and valuable lessons revealed from his encounters with the dead through specific instances where his unique talents have lead to personal healing, spiritual awakening, and even helping to solve a murder case. The holidays are officially upon us and while we all love what comes with this time of year there is just no denying a certain level of stress that is an unfortunate side effect. Between arguments over whose family to spend time with to anxiety over gift shopping, it's important to find ways to keep yourself balanced and calm. We all can only hear Silent Night so many times before we start to get that little twitch in our eyes. So, in my best attempt to help bring some resolution to these holiday stressors I put together a perfect little trick to help make it to 2016 with your sanity intact! One of the easiest and most effective ways to find peace is simply through the use of crystal healing. I've mentioned the different ways crystals can help clear negative energy or help to ground us but usually these crystals are placed around ones home and they aren't available on the go. With that thought in mind I found myself inspired by a long-standing jewelry trend of layering chains. By fashioning crystals on different length chains while following the guidance of the chakra system it is the perfect way to bring your crystals everywhere with you this holiday season, along with your sanity. Keep in mind while creating your crystal necklaces that you don't necessarily have to include all 7 chakras. For example, if you find you're most frustrated when no one in your family seems to ever hear what you're saying, try wearing a blue tigers eye close to your throat. The blue tigers eye will help to release the 5th chakra, your throat chakra and will assist you in speaking with clarity. The 7th chakra is what connects us with our spiritual self. Finding inner-peace and balance in this chakra is what will create positive thoughts. Staying positive and not letting anyone else's negativity effect us is solely connected to how our minds receive information. Help protect yourself by keeping the crown chakra healthy and balanced. The 3rd eye, home to your intuition is exactly the tool you need ready to go while battling crowded shopping centers and will help assist in making every shopping excursion a successful one. It can be daunting having to buy for everyone and having your intuition clear will help make your life that much easier. The 4th chakra, the heart chakra might be the most important one to keep balanced during the Holiday season (you don't want to end up with a heart two sizes too small). Bringing balance to this chakra is essential because it is from here that we are able to draw love, forgiveness and self-control. This chakra has a lot of control over our moods. It is from this chakra that we are able to access humor, laughter and warmth. I personally believe that without laughter I wouldn't be able to get through any difficult times. Laughter can really spread joy and help make this time of year truly magical. When this chakra is unbalanced it can cause us to become insecure and overly sensitive to criticism. The first chakra, also known as the base chakra is ultimately about physical health and satisfying our physical needs. It is about survival and surviving the holidays can sometimes feel like an impossible task. Click above to check out TheSilverWhale - a beautiful shop on Etsy with great crystal pieces for layering! In recent months my ConnectHer retreats have taken me to new and exciting places. Most recently I had the opportunity to visit Boulder, Colorado and while I was there I decided to do a little exploring. One of the first things I discovered while taking in this wonderful and unique city was the Boulder Dushanbe Teahouse. A girlfriend and I had heard from a few locals that it was worth trying so we made a point to go there for lunch one day after the retreat. However, it wasn't until I arrived that I discovered just how special and one of a kind that this place truly is. But first, let me talk about the food. Everything we tried was absolutely delicious. From the Greek Meatballs to the hummus nothing disappointed us. It was such an interesting mixture of different cultural cuisines all combined in such a fresh and different way. I've been spoiled with years of amazing NYC restaurants so whenever I find something on par with that level of excellence I definitely take notice. Now, let me get into the most interesting aspect of the entire restaurant. The Boulder Dushanbe Teahouse was originally constructed in Tajikistan and brought over to Boulder piece by piece and re-built. It was given to the city of Boulder as a gift from Mayor Maksud Ikramov because Boulder is the sister city of Dushanbe, Tajikistan (the capital of Tajikistan). If one were to dig straight through the earth from Boulder, CO they would happily arrive at Dushanbe upon completion. What an amazing way to unite two very different cultures. I give Mayor Maksud Ikramov a lot of kudos coming up with such an original and creative way of bringing a piece of Asia to the States. Especially since it is a piece that very few here know a lot about. This opens the door to such a powerful opportunity for the people of Boulder and all it's visitors to experience a culture that is quite literally on the other side of the world from them. If you find yourself in Boulder, Colorado I have to insist that you pop in and check it out for yourself. The painted and carved ceilings are absolutely breathtaking. If you live in New York City you know that one of the most appealing aspects of living here is all of the amazing museums scattered like gems throughout Manhattan and even the five neighboring boroughs. I myself, like many other New Yorkers, have a personal favorite museum and that is The Metropolitan Museum of Art (aka the Met). The exhibits are always changing which means coming to visit every few months brings a fresh batch of inspiration. Upon my last visit I came across a brand new exhibit, one that left me feeling motivated and excited. Titled "In and Out of the Studio" this exhibit presents one hundred years of portrait photography from West Africa. The pictures range from the years 1870-1970 and really give an amazing insight into life throughout this time period. Even though it is common in the West African culture to not smile in many of the photographs you can still see so much emotion in the images. From pain, to excitement, to pure joy, all of these emotions can be found throughout the collection. However, what really peaked my interests was the constant thread of traditional clothing and beading that is present in a lot of the portraits. Adorning ones clothes and body with intricate beadwork has been present for centuries in African history. Yet what is most interesting is what these beads can represent. For example, in many African villages along the eastern cape one would be able to identify who the village "healer" is by the beadwork that a person wears. According to mdantsaneway.com, "Novice healers wear single white strings of white beads around their heads, wrists, elbows and ankles, while experienced older healers have the right and privilege to wear much more opulent and elaborate bead work." The rituals and traditions of Africa have been established for many centuries. What I love so much about the exhibit at the Met is that even though its focus is on just one small part of African history the beadwork and significance of what these beads represent is still demonstrated. It’s an important reflection on how a societies customs and traditions are passed on for centuries. The exhibit runs from August 31, 2015 - January 3, 2016. If you are around the city and have to time it's definitely worth a visit. My dear Libra, you are the friend that every great friend group needs. You are the peace-keeper, the reasonable, considerate one. You are gracious and on the constant hunt for balance. You have quite a creative side but you need everything to look beautiful, often times being a bit of a perfectionist. Your fashion sense is timeless and always perfectly manicured. Truly you are the guiding light of mixing fashion forward looks while still being appropriate. So in honor of our Libra's superior taste in all things respectable we will use this month to guide us in stylish, work-appropriate fashions. I recently came together with one of my dear friends, Kathryn Holt, to put together an all women's retreat in Boulder, Colorado and it was a spectacular event for me. Ten attendees from all around the country came together and we had an opportunity to teach them the basics of the Shamanic Medicine Wheel. The day was focused on re-dedicating oneself to their own personal power. Everyone had a chance to dance. play, and explore places in ourselves we so easily ignore in our day-to-day lives. One of the main elements that made this event so incredibly successful was the perfect location, The Star House temple. The Star House was co-founded and constructed by a small group of people dedicated to the principles of Sacred Geometry, StarWisdom, Sacred Union, Mythical Theatre, and Community Ceremony. This temple was built using the principles of Sacred Geometry, specifically the geometry of the Flower of Life. This 12-sided temple is inspired by intersecting circles which create a vesica piscis where the circles overlap. Integrated with the map of the chakras, The StarHouse resonates with energy, physically and spiritually. When you walk into the space there is an immediate calmness about it that I think put all of our event attendees at ease. This allowed for everyone to feel comfortable and really open to the teachings. The lands even had these gorgeous crystal boulders, a Quan Yin alter that honor people of all spiritual practices & 2 labyrinths.. It was definitely a place that nurtured spiritual growth and acceptance. I truly appreciate everyone who was able to come out to the event and can't wait until the next one! If you are interested in attending our next event it will be on November 4, 2015 in Denver, CO! Upcoming retreats will be held in New York City, Los Angeles, Nashville, TN and Denver, CO. Be sure to check back soon for more details! Recently, as I was strolling the streets of Manhattan, I started to notice a different sign for Palm Readings every two or three blocks. They ranged in prices anywhere from $5 to $25 but the more signs I passed the more that palm reading, also known as Palmistry, was on my mind. The main reason I really love this practice is because it's almost a comfortable gateway into the spiritual world. Many people, understandably, are a bit uneasy when it comes to mediums or spiritual healers, often for differing reason but uneasy nonetheless. Palm reading however has lightness to it that people find entertaining. I've seen palm readers everywhere from the boardwalks of NJ beaches to the homes of housewives hosting dinner parties. So in honor of this age-old practice I thought I would give a little basic lesson on palm reading to give you guys a little glimpse into the world of Palmistry. It is important to note that since this is an ancient practice there are many differing interpretations or practices and from my experience with mystical rituals, often there is no one right way. - Many believe that the left hand represents an individuals potential while the right hand represents what was done with that potential. - The very shape of our hand actually has a lot to do with palm reading as well. There are four different shaped hands represented by the 4 elements of Earth, Wind, Water, and Fire (Note: your hand may represent a different element than your Astrological sign). Water - The palm is short and oval, often wider than it is long with long fingers. - The lines on your hands have four major readings: The heart line, the head line, the line of fate and the life line. Heart Line- Your heart line can tell you many different things. It can tell you if you are satisfied or selfish or even disinterested in love. It can show you if you are the type of person whose heart breaks easily or if you are more practical in love. Head Line - This is the line that shows your type or level of intellect. It can express if you are a more creative person who loves spontaneity or one that desires a life of structure. It can show if you are a more spaced out thinker, a focused thinker, or a realist. Fate Line - This is my favorite line, the line that comes with the most mystery. The fate line can show the future. Many people do not have fate lines at all and this could be that they are not as strongly controlled by destiny. Destiny has a funny way of working itself out, often people are not open and unable to let it take its course. There are many different aspects of your palms that can be read, from your fingers down to your wrists. This is just the jumping off point for Palmistry but a fun little insight into a world that seems to always be around us but often goes unnoticed.